May 22, 2013: As the race to bottom continues with consumers asking for cheaper and cheaper clothes – the workers are paying the price. For the moment some of the cheapest work forces in the textile sector are to be found in Bangladesh. The tragic accident in Bangladesh that shocked the world when more than 1200 workers died in one of the worst workplace accidents in many years did not come to a surprise to anyone working in the textile industry on the international level. IndustriAll (that represents the textile workers) and UNI global union (that represents the retail sector) together with some NGOs and the ITUC managed to push a lot of textile brands to sign an agreement on fire and safety. This is amazing work that hopefully will change the conditions for some of the poorest and most precarious workers in the world, and the ITUC congratulates the GUFs for this historic breakthrough. Jyrki Raina from IndustriAll said after the launch of the agreement: “We are talking about improving the working conditions and lives of some of the most exploited workers in the world, earning $38 a month in dangerous conditions.” The global sportswear brands have been pushed to take action for many years through the Play Fair campaign. They all adhere to one Code of Conduct or another – but all leave loopholes that keep the workers paying and paying again. Now this is true also for the high-street clothing brands. We know from investigations in factories in nearby countries where workers have similar conditions (Play Fair reports in 2008 and 2012) that very often workers will put safety aside to make the quota and the money so they can feed their families. We also know that the workers are not being taken seriously when leaving complaints, and often too scared even to make the complaint in the first place. Suppliers (the factory owners) repeatedly lie to auditors that are investigating conditions and safety for the brands that are produced in their factory. However, the biggest power lies with the clothing brands that are so powerful that they in principle can ask for any conditions and force the suppliers to comply. First to sign up to the agreement was H&M, followed by Inditex, C&A, PVH, Tchibo, Tesco, Marks & Spencer, Primark, El Corte Inglés, jbc, Mango, Carrefour, KiK, Helly Hansen, G-Star, Aldi, New Look, Mothercare, Loblaws, Sainsbury’s, Benetton, N Brown Group, Stockmann, WE Europe, Esprit, Rewe, Next, Lidl, Hess Natur, Switcher, Abercrombie & Fitch, Bon Marché, John Lewis, Charles Vögele, V&D, Otto Group, s.Oliver. The popular American brand Gap has not signed up either, despite professing a commitment to Labour rights and pressure from shareholders at their recent AGM. May 22, 2013 – Bangladesh is sadly one of the countries where the labour and the lives of working people are not valued. This is typical of the current model of globalisation which is not humane and not sustainable. Globalisation in the manufacturing and service industries began to sharply accelerate in the 1980’s as advances in communications and transport technology enabled companies to begin exploiting the vast global workforce on a scale which was previously impossible. Firms adopted business models based on locating production in countries where labour laws are weak, virtually non-existent or poorly enforced, and thus workers are effectively blocked from organising unions and engaging in collective bargaining with employers. The global supply chain has become a standard means by which international brands are able to maximise revenues and continuously seek an edge on their competitors by driving production costs ever lower. So tragically but not surprisingly it has taken a fire in the Dhaka suburb Savar, which has seen the loss of more than 1200 lives, for major corporations to accept responsibility for safety. Our heartfelt congratulations and thanks go to IndustriAll and UNI for their achievements in ensuring a strong agreement. But there is more to be done. After years of demands from local and international union voices for labour law reform reinforced by the analysis of the deficits by the ILO Committee of Experts, the Bangladesh Government is still dragging its heels. We demand labour law reform that meets the test of ILO standards, and you and your governments can help. Briefing your governments on the agreement, urging their call for national brands to sign the agreement and to pressure the Bangladesh Government to reform their laws ahead of the ILC will help. Further, Walmart and Gap must get the message that they cannot stand outside a binding agreement. The ITUC is heading a mission to Bangladesh this week to work with our affiliates and community actors to formulate a plan for organising for labour reform and union growth. We have the ambition to propose to the General Council that Bangladesh be listed as a ’Country as Risk’ target for 2014. Ultimately, it is only unions, with the right to freedom of association and collectively bargaining, who can organise to protect workers from exploitation, to achieve safe work and fair wages and conditions. Only unions can and will hold employers and governments accountable. Jeff Vogt from the ITUC explains how it really works. 1. What does Bangladesh labour law looks like currently? The government has failed to enforce the laws it has on the books. This is not merely a question of a lack of capacity, but also reflects a deep-rooted anti-union bias, in part due to the enormous influence that the garment industry (and others) has over the government. The labour law was amended in 2006, but still has several serious deficiencies, including the wholesale exclusion of many classes of workers, high thresholds on the minimum number required to form a union, restrictions on the right to choose their own leaders, restrictions on collective bargaining and several on the right to strike. The ILO annual report on Bangladesh runs for several pages, cataloguing numerous deficiencies in law and in practice. The tens of thousands of workers employed in export processing zones have no right to form a union (only associations) and are by law barred from talking to unions outside of the zones. Workers are fired for trade union activity with near complete impunity. 2. What are the most urgent changes to the labour law that you would like to see? The unions in Bangladesh have indicated several priorities, which include measures that would no longer require the government to hand over a list of the names of the union founders to the employer (who then fires all of them with impunity), the ability to elect officers outside of the enterprise (who have experience in bargaining) and to lower the threshold requirement for forming a union (now 30%), which is quite high. At the same time, the law currently excludes many workers from its coverage, and the unions want to see the law apply to all workers. They have indicated several other priorities related to strikes, termination, benefits, etc. 3. Can the law prevent accidents like the one a few weeks ago from happening? Anyone who has worked in Bangladesh has known that garment factories are extremely dangerous places to work, as many are fitted with cheap wiring that can lead to fires or are built without solid foundations, leading to collapses. The companies have an obligation to keep the workplace safe, but have failed to do so. Near non-existent inspections have meant that companies have been able to operate without doing anything. After past fires, the industry would make promises and not follow through. However, after the Tazreen fire in 2012, which provoked international outrage, a national plan on fire safety was developed. It is too soon to judge whether this plan will have a meaningful impact. What would have helped are strong unions that could have demanded that workers not work in deathtraps and that workers could remove themselves from danger when it arose. The recent deaths in the garment sector are a direct result of the refusal of the government to register unions and the industry to recognize and negotiate with them. So yes, new safety laws can help if they are enforced. But equally important is the enforcement of laws permitting trade unions to form and operate. 4. Has Bangladesh ratified the ILO core conventions? Yes, Bangladesh has ratified 7 of the 8 core conventions, including Convention 87 on freedom of association and Convention 98 on collective bargaining. The problem is not ratifying conventions, but rather transposing those conventions into national law and then enforcing those laws effectively. 5. What does the new Fire & Safety agreement bring to the table? The Global Unions – IndustriALL and UNI – made history in reaching an agreement with more than 30 garment brands, mostly European, on a comprehensive agreement on fire and building safety. It requires inspections by competent, independent experts, requires companies to remediate violations when they are detected and creates a worker complaints process. The agreement will be managed by a steering committee, which will include trade union representation. The agreement also has important language on transparency, which makes public lists of factories and inspection reports. 6. What responsibility do the clothing brands have? Some of the problems we see in Bangladesh are the direct result of the sourcing practices of garment brands, which demand orders be filled quickly and at the lowest possible price. The thin margins put tremendous pressure on manufacturing companies in Bangladesh to cut costs, leading to extremely low and at times unpaid wages and utter neglect for health and safety. The fast turn-around leads to excessive hours of work, with overtime typically unpaid. The situation is even worse at the level of subcontractors. The brands of course know this but have not changed their practices, nor have taken serious steps, until now, to address the safety issues. The garment industry needs to re-think its model. 7. Corporate social audits were long seen as a solution to worker rights issues in Bangladesh and elsewhere. What now? May 22, 2013 – Next week the ITUC is sending a mission to Bangladesh in order to meet with the Bangladesh affiliates and together create a comprehensive, multi-year “country-at risk” plan. The plan will focus on at least three areas. First, Bangladesh must enact meaningful labour law reform consistent with ILO standards. Today, the labour law allows workers to join or form unions and to bargain collectively but imposes several serious limitations on those rights. Further, the government has routinely failed to apply or enforce existing law in an effort, with employers, to keep unions out of workplaces. For years, the ITUC has pressed the government on its substandard laws. A renewed push for robust changes to the Labour Act, as well as the labour law governing the EPZs (which prohibits unions and allows only for “worker associations”), as well as its effective application, will be central to the plan. Second, in coordination with the relevant GUFs and solidarity organizations, ITUC will support efforts to organize in the vast garment sector, as well as in other key export-oriented industries, including the EPZs, shipbuilding, shipbreaking and seafood. Finally, we will look to support workers’ demands on wages and social protection. 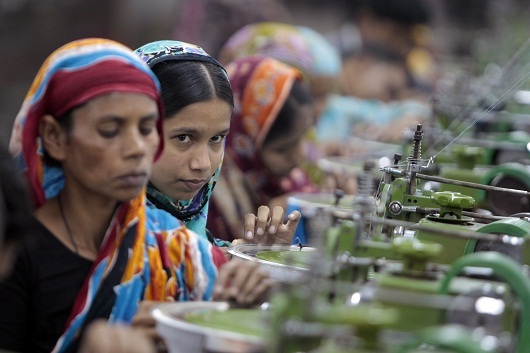 Wages in Bangladesh are among the lowest in the region – and actually – in the world. There are laws requiring payment of 5% of profits into a fund, the only social security workers have, but rarely respected in practice. The ITUC will work to raise wages and ensure that all benefits which workers are owed are paid in full. Of course, many other problems need attention, from child labour to trafficking in persons. In conjunction with the local trade unions, we will keep monitoring these issues and intervening where possible. The clock is ticking for some of the world’s biggest retailers, such as Gap and Wal-Mart, to sign a landmark agreement to improve safety conditions in Bangladesh. The Accord on Fire and Building Safety was initiated by IndustriALL, UNI Global Union, the International Labour Organisation (ILO) and a group of NGO partners following the deaths of over 1,127 workers in a building collapse last month. The legally-binding five year agreement was signed on Monday by a group of seven European retailers including H&M, Inditex (parent company of Spanish clothing and furnishing brand Zara) and Primark. But despite a looming deadline of 15 May, a bloc of mainly-American retailers are yet to sign. In fact, the only American retailer to have signed the Accord so far is PVH, the parent company of Tommy Hilfiger and Calvin Klein. Other big European retailers such as Benetton, Carrefour and Mango are also yet to sign. The Accord will bind retailers to blacklist manufacturers whose factories fail to meet safety standards. Retailers have also pledged to pay for repairs and renovations in the factories. And crucially, the Accord also grants workers the right to refuse dangerous work, in line with the 1981 ILO Convention 155 on occupational health and safety. The Convention has been ratified only by 60 countries, excluding the US and most European countries. However, it appears that the non-signees of the new Accord are concerned about how much it will cost to enforce these new rules as well as how legal matters will be resolved in the wake of the agreement. Gap, for example, has said it will not sign the Accord until changes are made to the rules on settling disputes. Cases will only go to court when there is an appeal – which very unlikely when arbitration is involved – or when one party does not respect the arbitration award. None of the other US retailers have said whether they will or will not sign the agreement before 15 May but according to the Reuters news agency, Wal-Mart did release a statement on Monday calling for the Bangaldeshi government to halt production at one of Wal-Mart’s Chittagong-based suppliers, Stitch Tone Apparels, where it found “structural concerns”. It has since suspended all orders with Stitch Tone. The Rana Plaza collapse in the Dhaka suburb of Savar on 24 April was one of the worst industrial accidents in history. The rescue operation only ended on Monday, almost three weeks after the nine-story building collapsed; now the spotlight is turning to those who survived the tragedy. Mojibur Rahman Bhuiyan of ITUC-Bangladesh Council has called on international retailers to pay compensation to the thousands of workers injured, many of whom still require medical support. The accident also brought Bangladesh’s garment industry, worth 20 billion US dollars, back to the world’s attention. Despite being the second largest garment exporter in the world after China, the industry is beset with health and safety issues, poverty wages and labour violations. In November 2012, at least 117 workers were killed in the Tazreen factory fire in Dhaka. Since then, there have been four other deadly garment industry accidents in Bangladesh, including the 24 April factory collapse. Following widespread worker protests across the country and the global outcry over the Rana Plaza tragedy, Prime Minister Sheikh Hasina’s government has announced a raft of measures to reform the industry. In a move that has been welcomed by trade union officials, on Monday, the Bangladeshi government said that workers would be allowed to form unions without obtaining permission from factory owners. “With collective-bargaining power, tragedies like Rana Plaza would not happen, since owners would not be able to force workers to work in unsafe conditions,” Amirul Haque Amin, president of Bangladesh’s National Garment Workers Federation, told the Wall Street Journal. The government also announced plans to meet with trade unions and factory owners to set a new minimum wage for garment workers. Currently set at around 3,000 takas (38 US dollars) a month, it is one of the lowest in the world. But Bangladesh has come under fire for taking so long to commit to change and there is some skepticism over what tangible impact these proposed government reforms will have – especially when more than 20 members of parliament are also said to own garment factories.